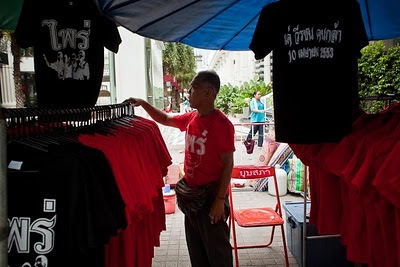 A Red Shirt tee shirt vendor sets up his “shop” before the protests kick in Sunday morning. Business owners in the Rathcaprasong district of Bangkok are howling mad. Rotchaprasong is the home to Bangkok’s most upscale malls, some of the city’s finest restaurants and five star hotels. The Red Shirts have invaded this hallowed shrine to mass consumption and most of the malls are shut down (the hotels and restaurants are open and have put on extra security). To give you an idea of how much retail space is impacted by the Reds, the New York Times has reported that the area shut down is five times the size of the Mall of America in Burnsville, MN, the biggest indoor mall in the US. It’s scant comfort to the businesses that have been shut going on two weeks now, but the Reds have brought their own economy with them. It’s rather amazing really. You can’t walk five feet without running into someone selling something. Need a watch? We go your watches. Clothes? As long as you’re willing to wear Red we can find you something. Services? Massages and haircuts are easy to find. DVDs and music CDs? If you’re not to queasy about the legality of pirated goods you can get pretty much whatever you want. Food? Street food is everywhere. There are some al fresco sit down places but most of the food is sold by hawkers and street vendors. It’s pretty amazing and says something about the entrepreneurial nature of the Thais. What the Reds’ street market has going doesn’t begin to equal what the mighty malls in the neighborhood used bring in, but if you want an authentically Thai shopping experience you could do worse. There are more photos of the Red Shirts street economy in my PhotoShelter archive.